Shermanbury – a long-term productive relationship. 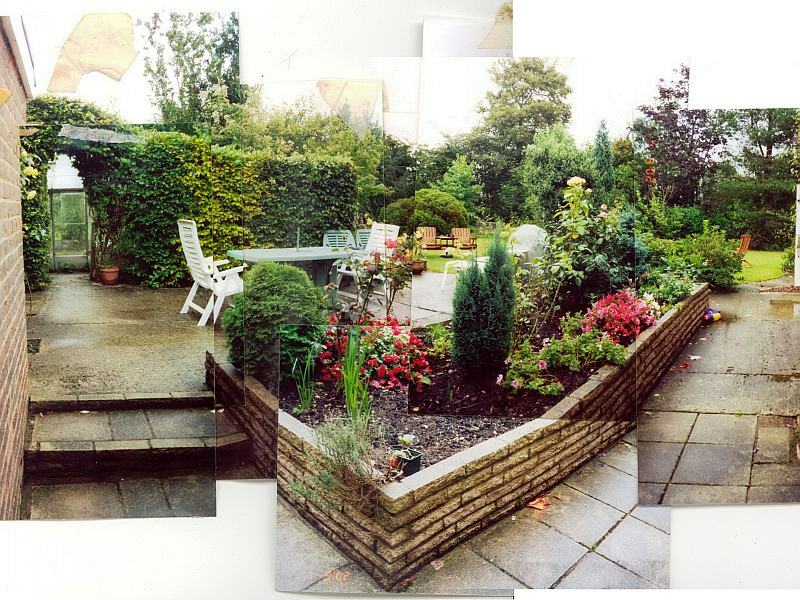 We first met these clients in 2003, when they needed advice on how to transform their 1960s concrete patio. 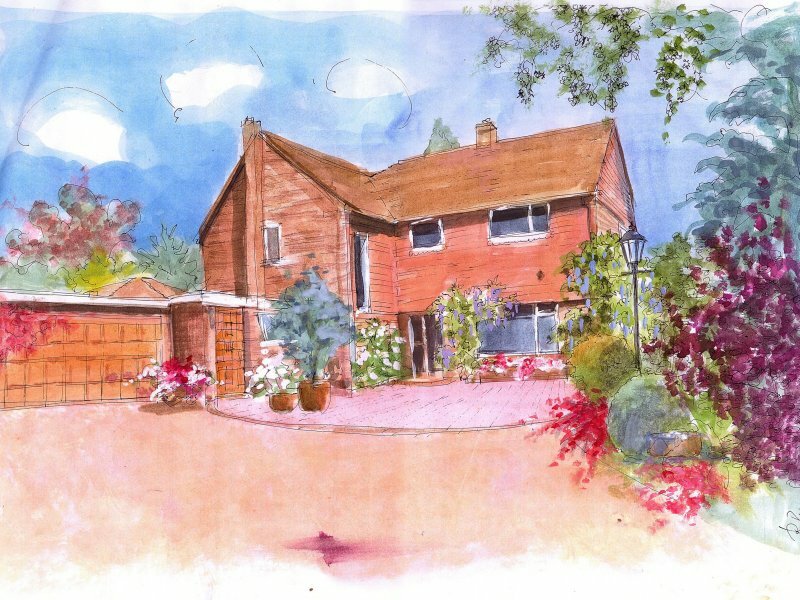 Over the years since, we have collaborated with this client many times, variously providing design, consultancy, plant supply and care, garden care and maintenance, as well as producing a portrait of the house as a memento for a visitor to take back home to New Zealand! To the client, the advantage of this kind of long-term relationship is that we get to know the client’s tastes and preferences very well, and we develop a quick and productive method of working. This means that new schemes are developed fast … and they meet the client’s needs exactly. This case study looks closely at that initial scheme. 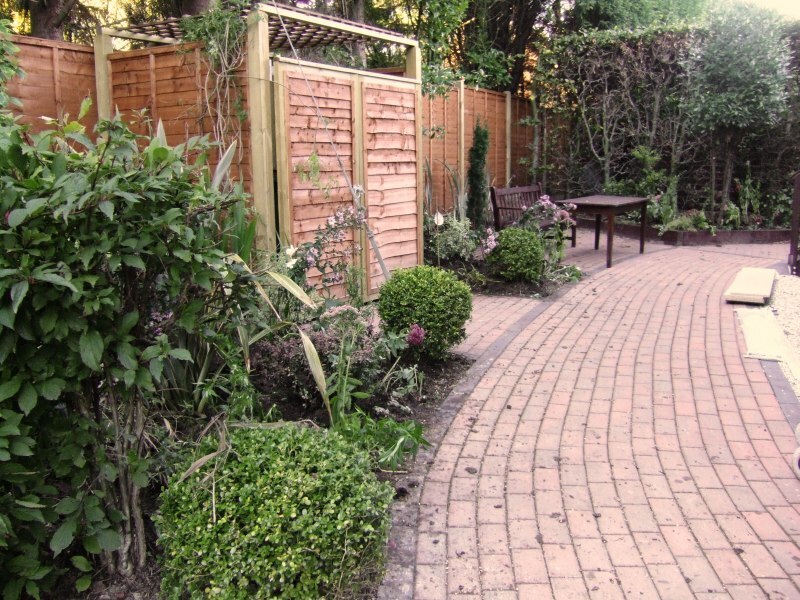 The existing setting was an over-grown, over-built, slabbed area, in perpetual shade. 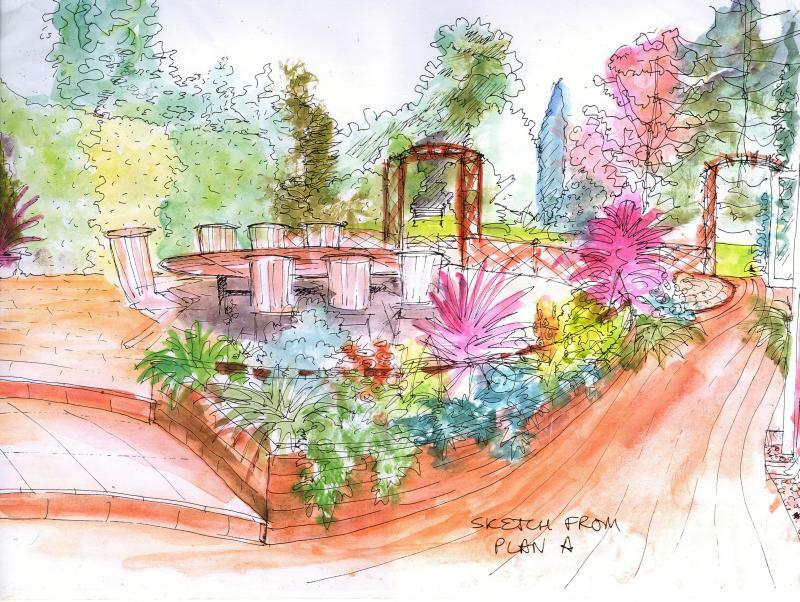 Our clients are sociable people, who see their garden as an important place for entertaining, so enhancing this use of the garden was crucial. 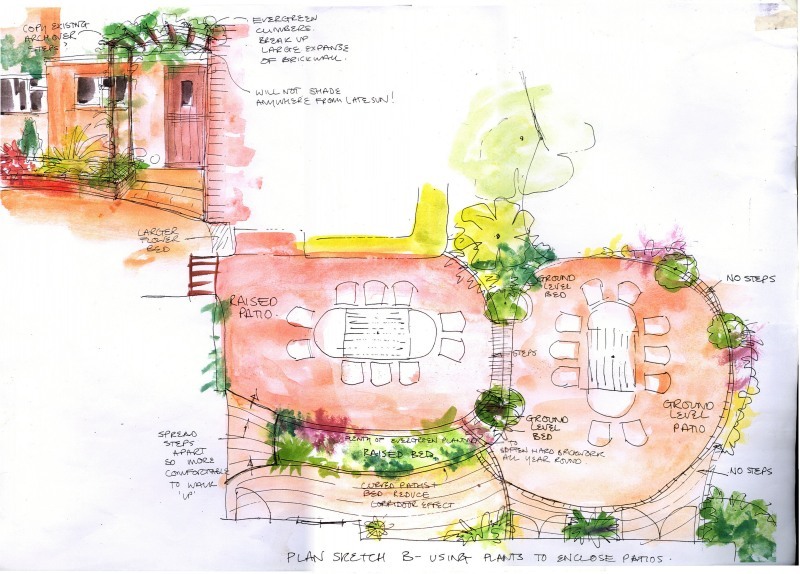 Also, they already had plans later to incorporate a covered hot tub, and later still to extend the house, so, right from the start, our designs accommodated these future developments. 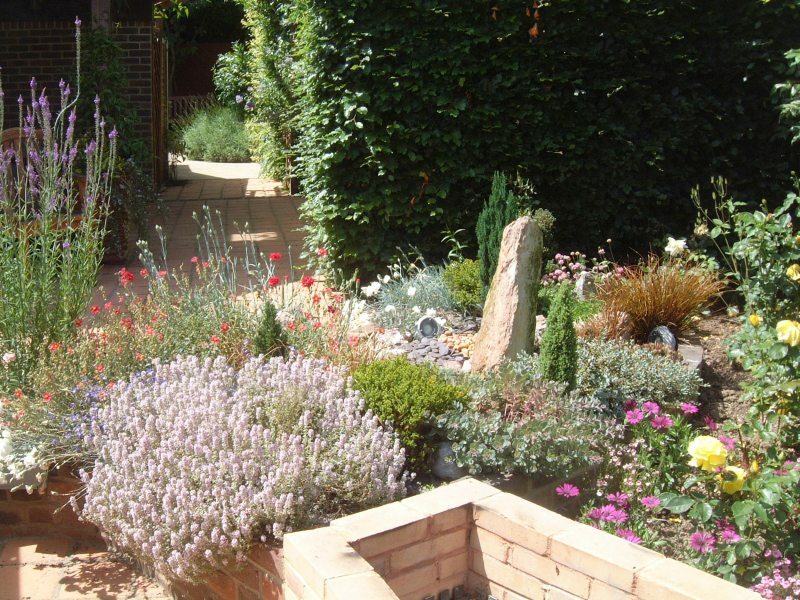 We are, naturally, very proud to have been associated with these clients’ fulfilling their long-term plans for their garden, and we hope that we will continue to help and support them long into the future. 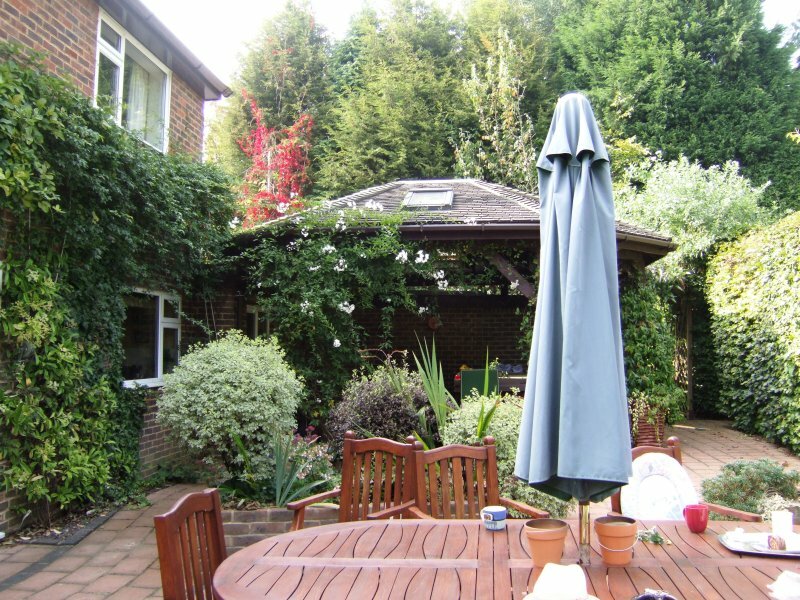 The back garden now - a sunny terrace, ideal for conviviality. 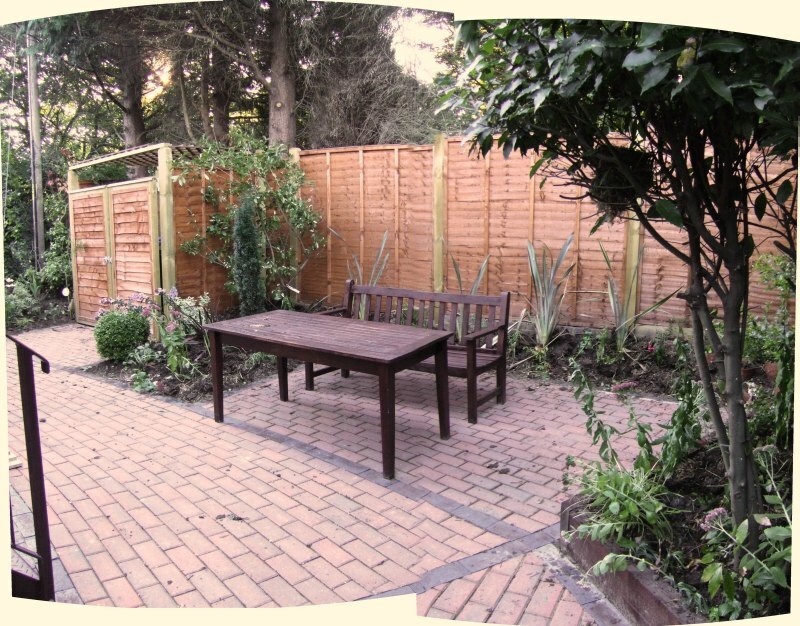 A portrait of the rear garden, showing it transformed after our first engagement here. At the outset - the back garden. Neat and well-cared for, but rather stiff and unimaginative. At the outset - the view from the back door. Although the garden is large, the effect is of peering down narrow, walled corridors. At the outset - the beds isolate house and garden. 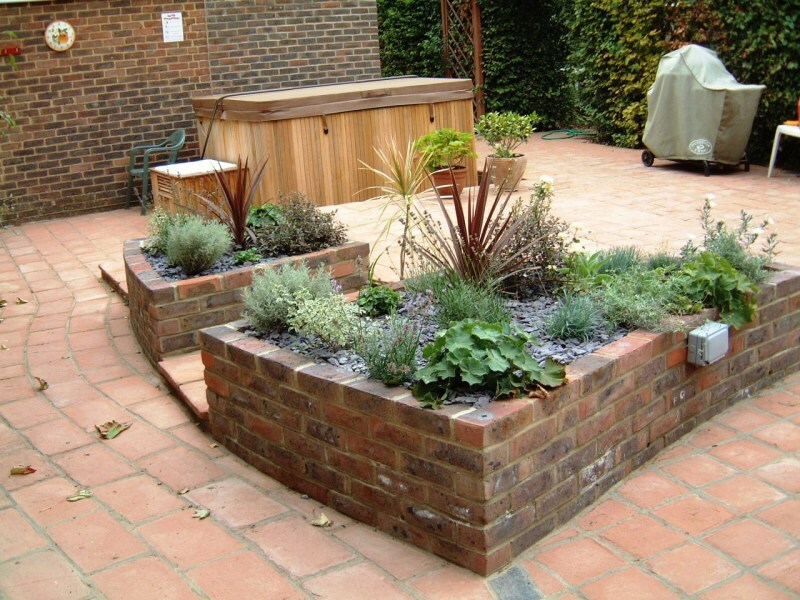 The arrangement of the existing raised beds made one detour around them to get to the terrace. Clearly, this impractical layout needed improvement. The proposed design - visualisation. This drawing is the visualisation that we used to show our clients our proposal, which was for a dressed terrace with long, elegant steps. This created two distinctive, well-proportioned and intimate “rooms” out of the long and narrow area. We proposed planting around with evergreens to give softness. A bonus was that we were creating an attractive feature out of the otherwise awkward level change. The proposed design - plan. Following our clients’ approval of the proposal, we overlaid the design on to an accurately-surveyed plan, for use by the clients’ builder. Later, we worked with builder and the supplier of the hot tub to produce an accurate working plan to incorporate the hot tub. 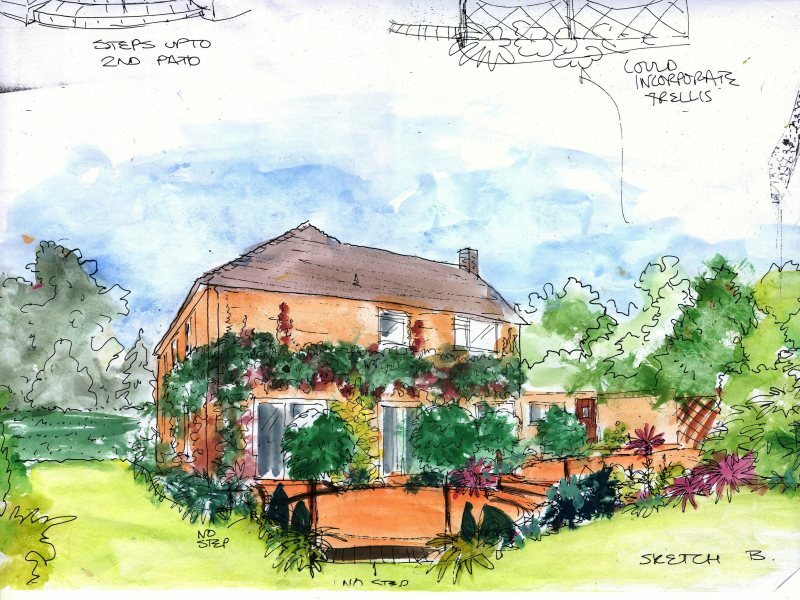 This sketch gave our clients an excellent sense of how the finished scheme was going to look. In particular, they could see that opening up the area completely eliminated that corridor feeling. We used a warm, terracotta slab to match the house. The slabs were set in a curving pattern for an informal, soft effect. The edge of the terrace was set with a dark engineering brick, in lovely curves that reduces the apparent bulk of the terrace. Even before it has acquired its natural patina, the effect is soft, warm and inviting. 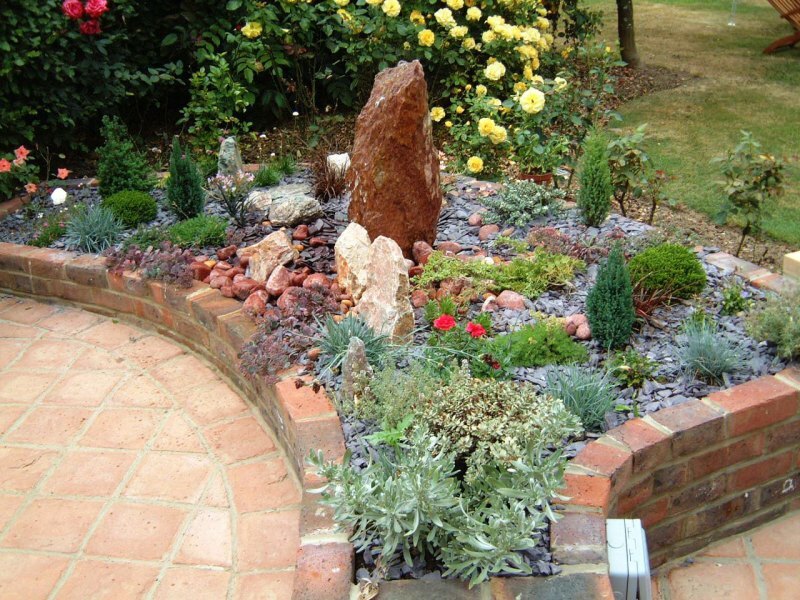 Insetting raised beds in this way gives interesting height and colour, and breaks up the large expanse of hard landscaping. The water provides delicate animation, and the beautifully arranged pebbles subtly modulate their colours in response to the constantly changing interplay between water, sun and breeze. The water feature nestles in the curves of the terrace, with the stone and plants toning attractively with the tiles and brickwork. Maturing: colour on the terrace. Some years after the raised beds were planted, they have matured to have these beautiful colours and textures. Also just visible in this picture, is the sail that we designed for a later phase of the project. It provides an attractive and flexible way, generously to provide shade from the summer sun … but only when it’s needed. 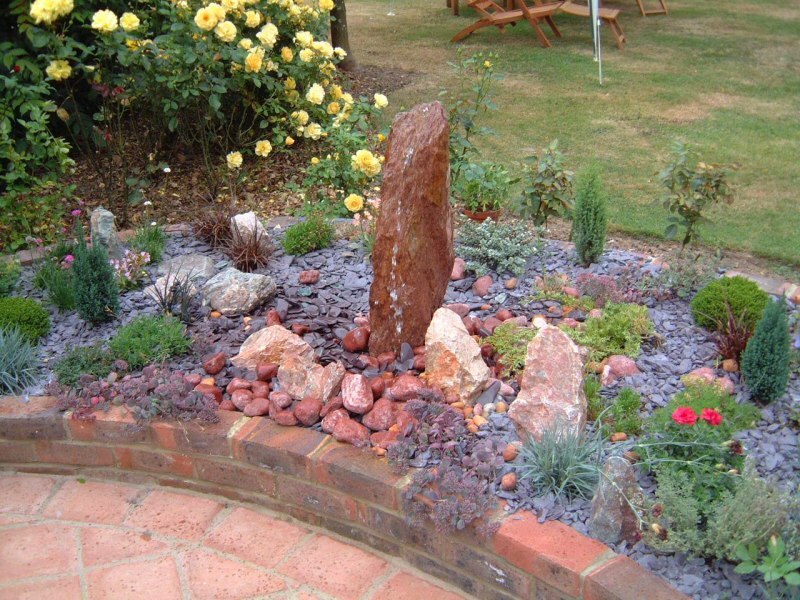 This more recent photograph shows how the plants around the water feature have luxuriated, filling out the space. Their contrasting shapes, habits and colours make a satisfying, rich ensemble. Maturing: the terrace with the roof added over the hot tub. This more recent photograph shows how the terrace has matured. It now has a weight and presence that it earlier lacked and the layout is perfect for socialising. It is sheltered and screened by the lush planting. The hot tub has its roof (in the design of which we collaborated) and the climbing plants give it an altogether exotic feeling. 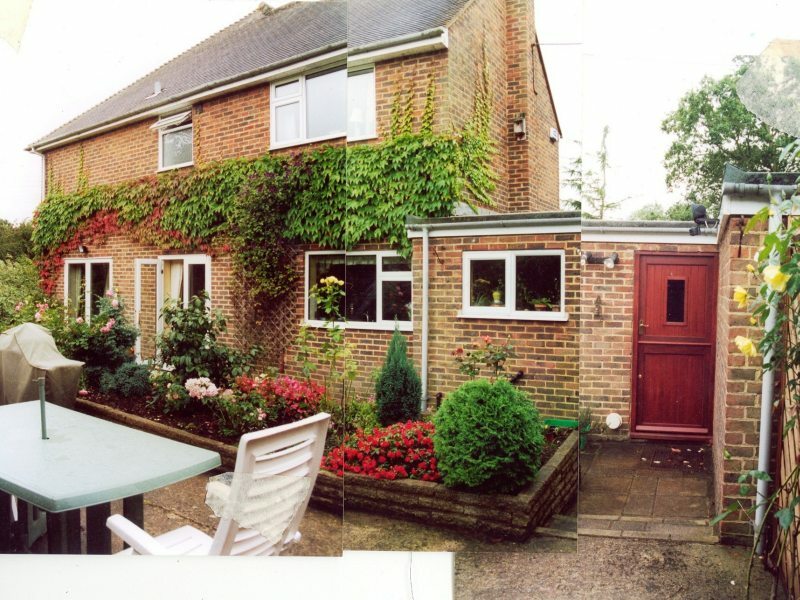 After the house was extended – a fresh opportunity. In 2010, the house was extended, in part to provide a home office facility. 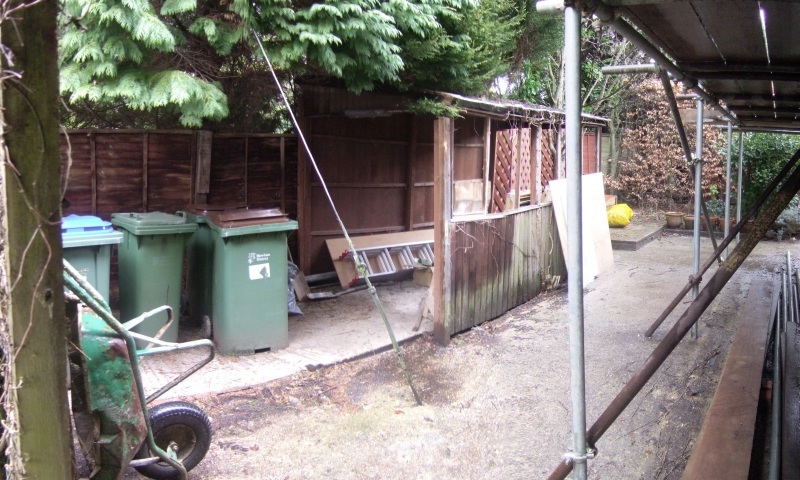 As the builders completed their work, the presence of the scaffolding, the wheelie bins, and the shell of the old potting shed conspired in a most unprepossessing scene. Yet, we felt this was a section of the garden that had potential. 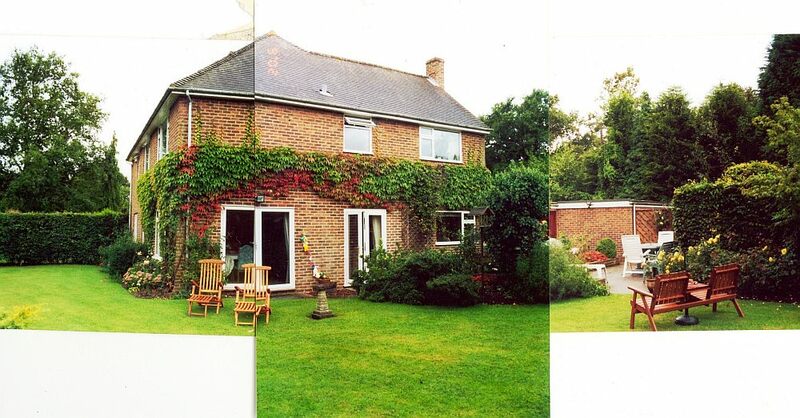 After the house was extended – beginning to realise the potential. We worked with our clients to make good use of the space that could so easily have become a very unsightly glory-hole. The wheelie bins now have dedicated, screened stowage. A paved pathway continues the theme of the terrace, to which it links around the rear of the house. Its bold, expansive sweep is exciting and generous, and there is a useful seating area, conveniently placed to enhance the usefulness of the home office, which is placed in the extended building. Another view of the new seating area. This shows the spaciousness of the new seating area. The contrasting brick edging motif has been transferred successfully from the rear terrace. 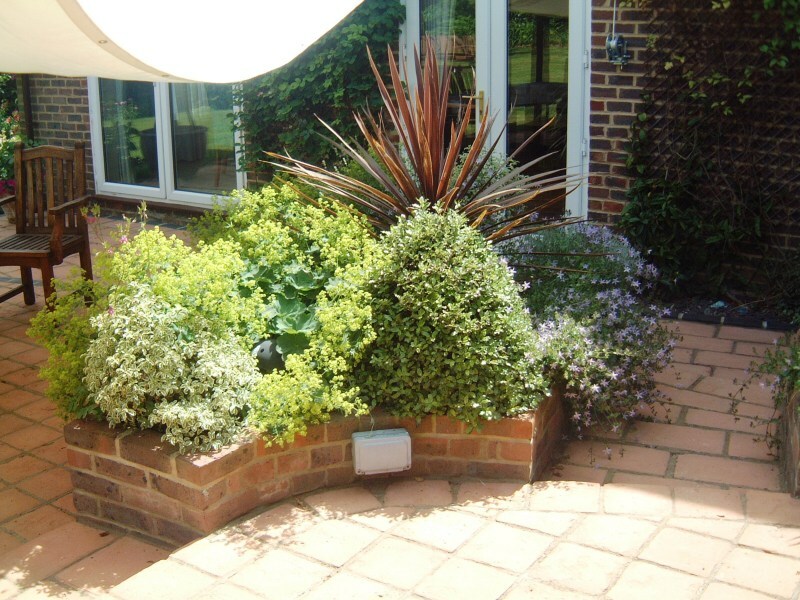 The planting will rapidly mature to create the same richness that characterises the rear terrace. 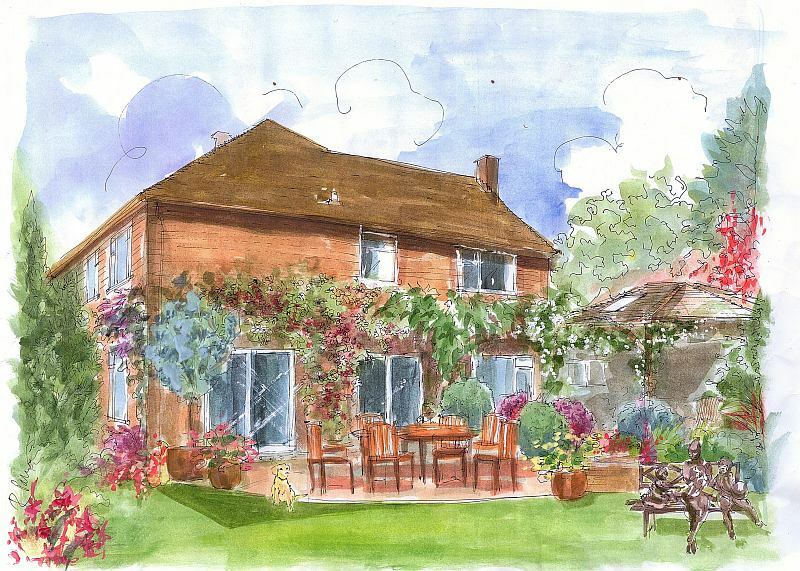 Our clients commissioned this portrait as a parting gift to a friend, who had been staying with them over the summer. The portrait is a unique and charming memento of her time in Shermanbury.